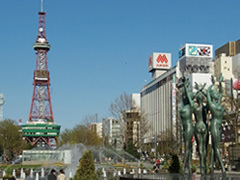 The latest spots and well-known sights are concentrated around Sapporo Station. The Odori area is a route for commuting to school. Residents can enjoy the "Sapporo Lifestyle" that people dream about. JR Sapporo Station and Odori Subway Station are centrally located, and students are able to walk to classes at SSM and SBA from the centrally located station. Popular shopping malls, famous electronics retail stores, and other businesses stand in front of the station, and unique shops targeting young people and specialty shops for enthusiasts dot the Odori area. The streets of Sapporo which people dream about, overflowing with stimulation and the latest culture, are the daily route for students commuting to school. Sapporo Stellar Place is a shopping mall located in JR Tower and directly connected to JR Sapporo Station. Stellar Place was the first shop of interest to arrive in Hokkaido and is the top cinema complex in Hokkaido. Hokkaido's fresh seafood, including crab, is brought to this famous market. The region has been called the "East Sosei River" and is an area of interest where very receptive local industry figures come together. The large Ferris wheel, "Noria," has become a landmark in the town. The building houses a bowling alley, karaoke shop, and an Internet cafe. Zepp Sapporo is a classic live house, with patrons mainly standing, where numerous famous artists have stood on the stage. Zepp Sapporo hosts other events in addition to concerts.